A commonly used agent is warfarin for anticoagulation. 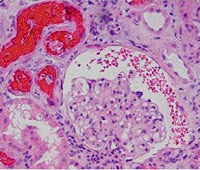 Recently there have been some published case reports of warfarin induced nephropathy(WRN). 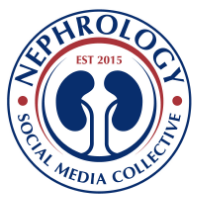 More recent, an original article on the incidence and prevalence of this entity in CKD has also been mentioned. What is this entity? High INR was associated with a rise in crt in biopsy of patients showed glomerular hemorrahge and renal tubular obstruction with red blood cell casts. A recent retrospective review of over 15000 patients who were on warfarin and had an INR >3 and creatinine at the same time were reviewed. A presumptive diagnosis of warfarin induced toxicity in the kidney was made if crt increased by 0.3mg/dl in 1 week after INR was >3. WRN occurred in 20.5%,and 33% of the patients with CKD. The mortality was also higher with people with this entity. Other diagnosis that could have cause an acute renal injury were considered in those 4006 patients and carefully ruled out by looking at the chart. 2. The risk factors to make this risk higher were age, DM, HTN and CVD but most important risk factor that doubled the risk was CKD. 6. WRN has substantial decreased survival rate but unclear if this is purely from WRN or other co morbid conditions. the red blood cell casts indicate glomerular hemorrhage, in biopsy-related red blood cell contamination of the slide the RBC are spread around the slide, there are RBC on the edge of the slide and no RBC casts.